Iberia has just taken delivery of their new A350-900 which you can read my review of here and Paul’s review here. However, you are far more likely to get their A340 if you chose to fly with Iberia long haul as they only have a couple of A350s so far. 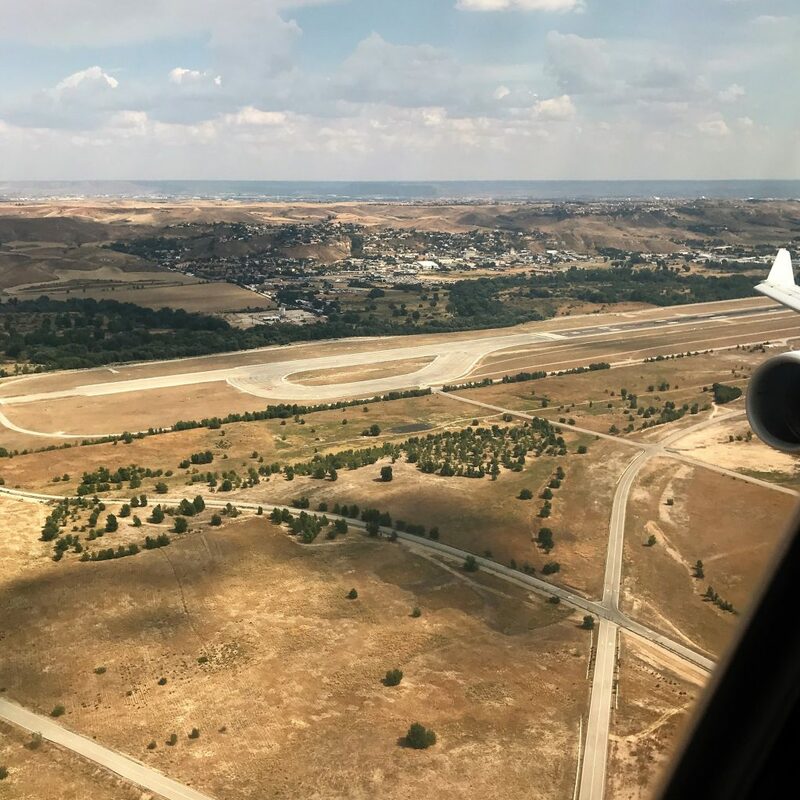 Fortunately or unfortunately, my original A350 flight from Madrid to London got switched to an A340 so it gave me a chance to review the A340 to see what it was like in comparison before I fly it on long haul next year. 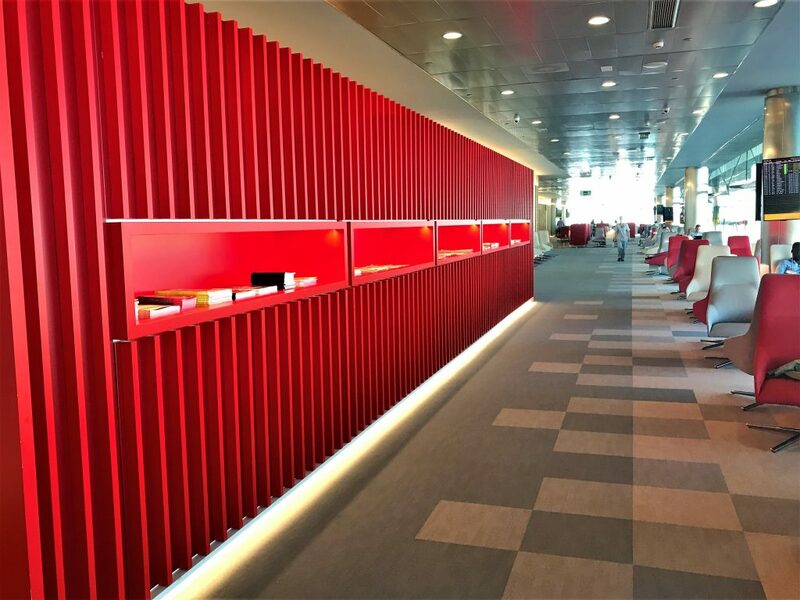 Iberia were flying from Terminal 4S at Madrid which has their new impressive lounge. The check-in area was fairly busy but the premium area was quiet. 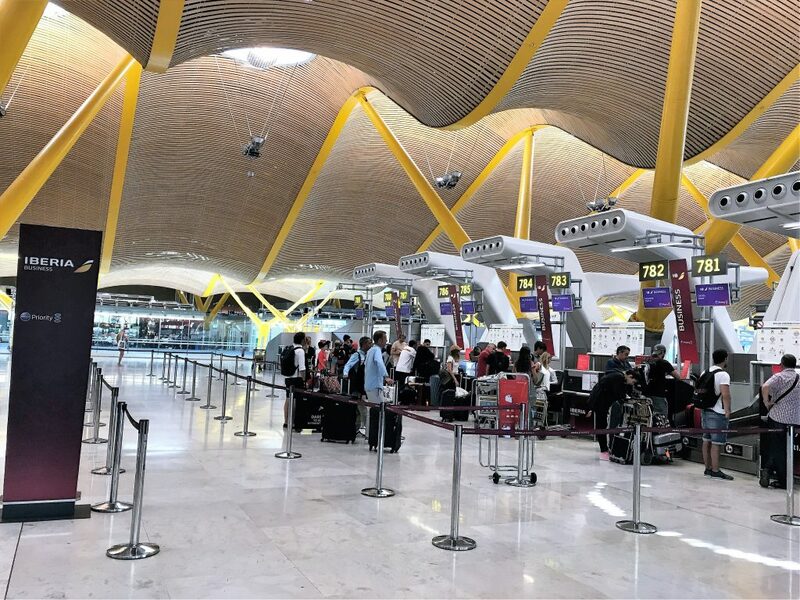 I was very impressed with the check-in agent who was almost over the top in his friendliness, calling me one of their best customers (which I am definitely not for Iberia) and being super friendly. I wasn’t complaining though as it was a fun way to start the trip. He took the time to explain where the lounge and premium security was too. I then went through the Premium security area which was pretty quiet as per the previous time I had gone through. 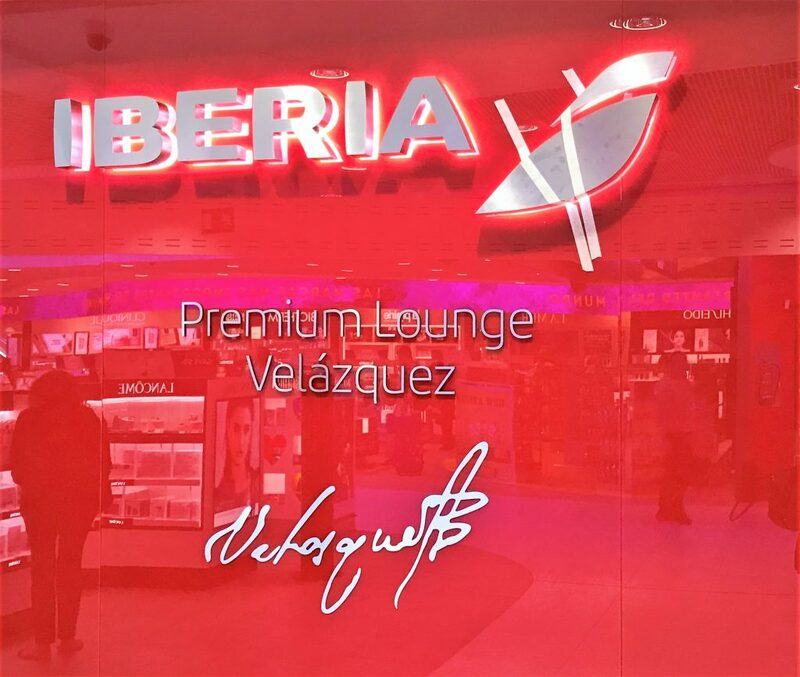 I did a comprehensive Iberia Velazquez lounge review in this article so I won’t go into too much detail here. The food was pretty much the same as before with salads, sandwiches, gazpacho soup and some hot selections. I tried some of the Rose Spanish wine which was quite pleasant. 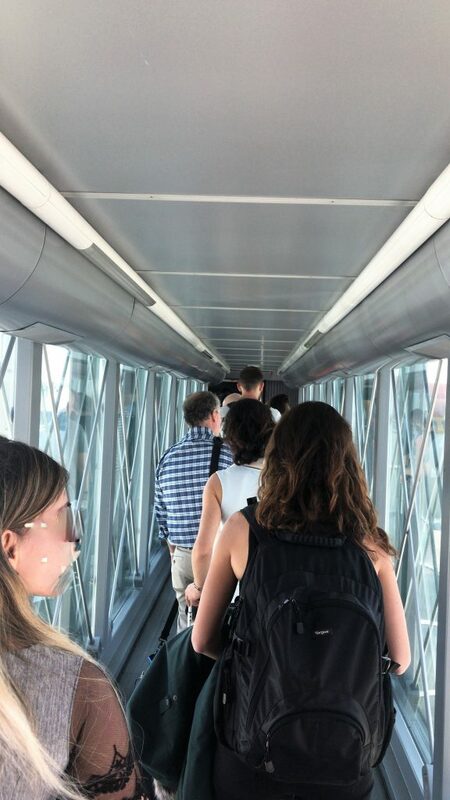 Boarding wasn’t great as they started premium boarding and then left us all standing on a hot stuffy air bridge as they weren’t actually ready for us, which always really annoys me. 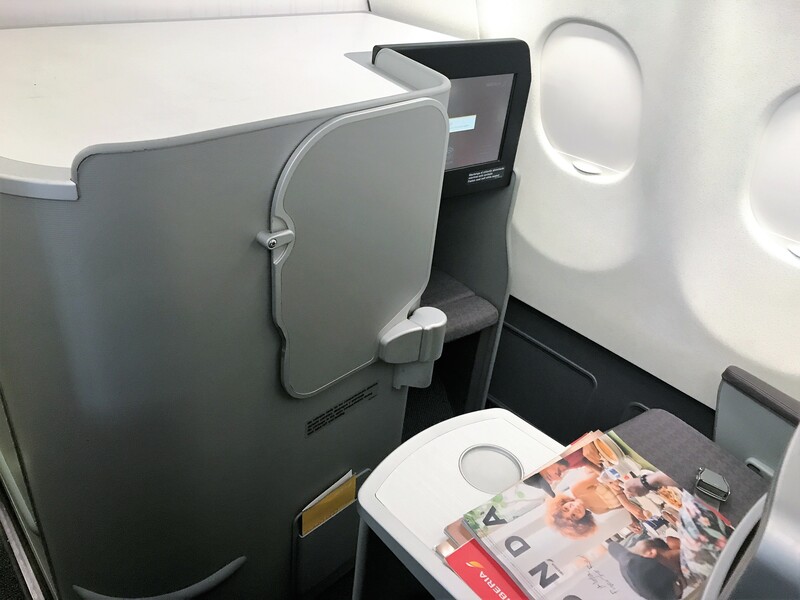 The seats are arranged in the same way to the A350 in a staggered 1-2-1 configuration. Middle seats alternate between ‘honeymoon seats’ which are close together to ones where the two consoles are in the middle making them quite suitable for solo travellers. 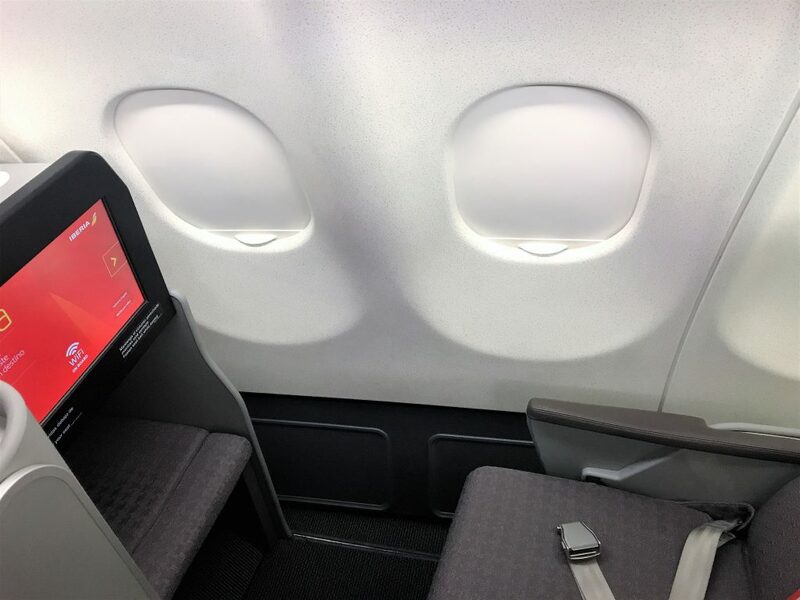 The windows seats also alternate where the console table is – either next to the aisle or the window. I prefer the ones that have the table by the aisle as they feel more private and I like to be close to the window for a bit of cloud gazing! I had chosen the front row with seat 1L. Normally I would not choose this on long haul flights as it was right by the galley. 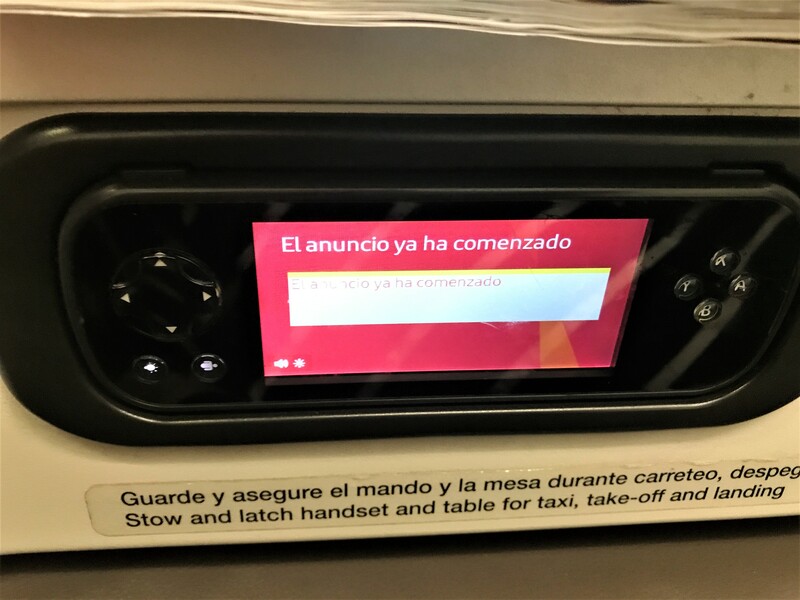 However, on this short flight from Madrid to London it wasn’t an issue. 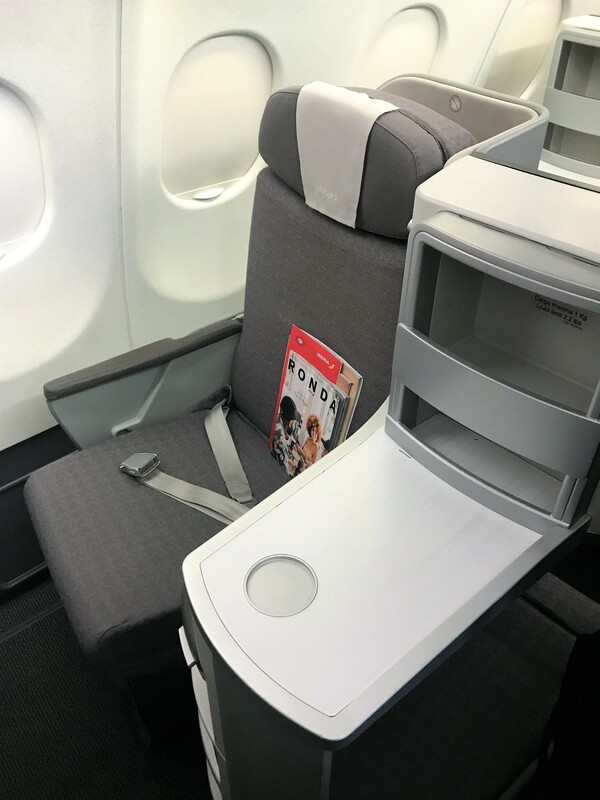 Although the seats are 2 inches less wide than the A350 ones it wasn’t that noticeable and I found them quite wide and comfortable. 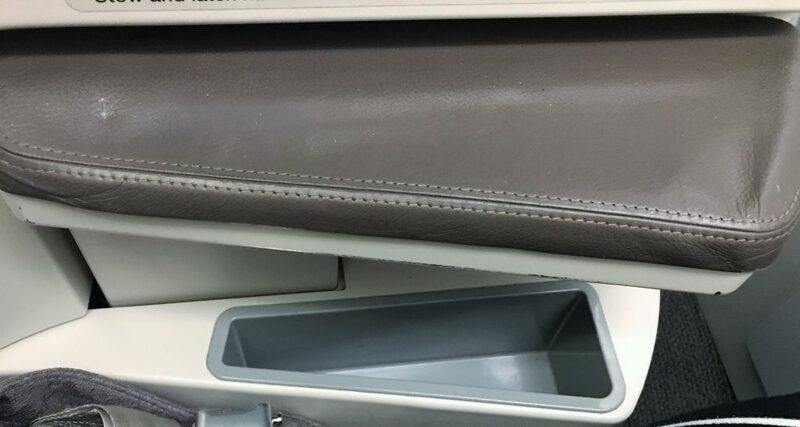 Your feet go into a cubby hole under the seat in front of you. These are like the A350 in that most of them are open-sided which feel much less restrictive when sleeping. As I was in the front row though mine was enclosed. The open-sided foot well would be my preference. The seat had fairly simple controls which were easy to operate. I would describe the seat as very slightly firm but I generally found it comfortable in all the various positions even when sitting upright for take off. 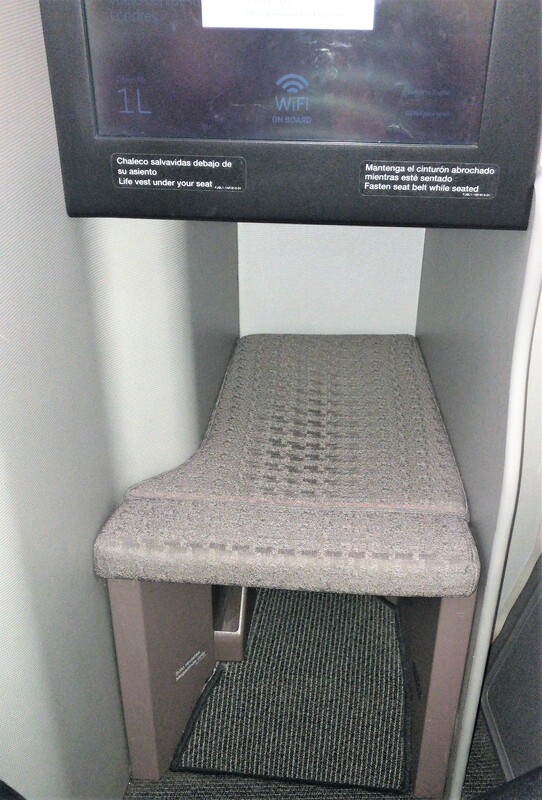 You could move the seat forwards so if you were shorter you could reach the footstool which was useful. As with so many airlines, there wasn’t a huge amount of storage for take off except a small side bin. Once airborne there was plenty of room under the footstool and on the large side console. There were also two shelves on top of the side table. 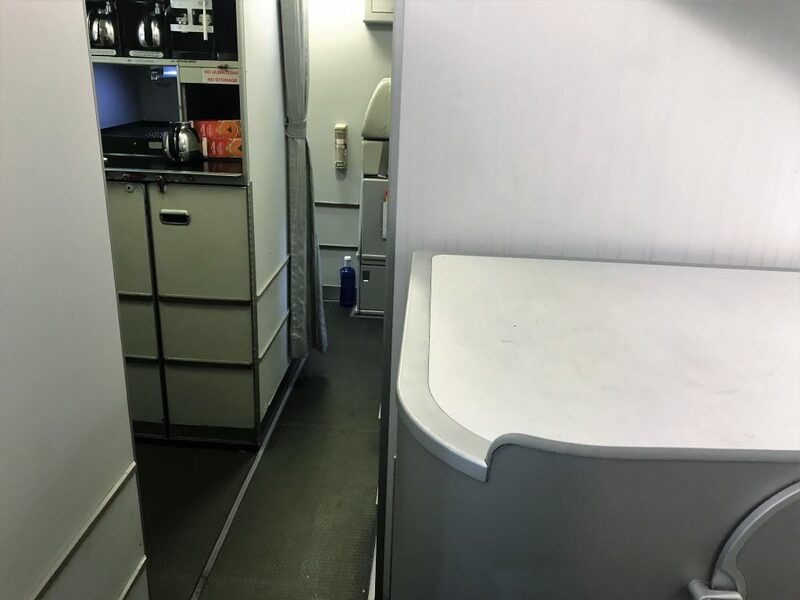 My seat was probably not one I would choose again on a longer flight as it did almost feel as if I was in the galley as you can see from the picture below. Unlike my A350 flight, I was given a proper menu this time. 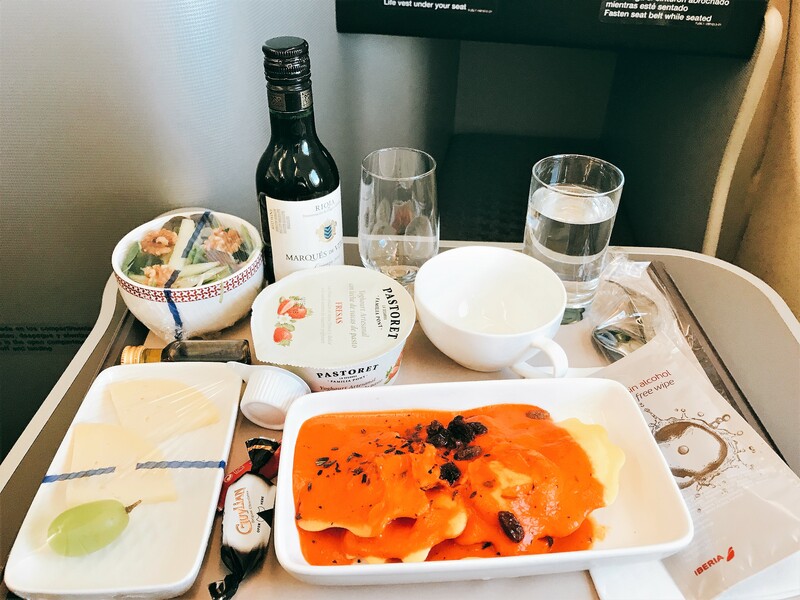 The food was very similar to my previous flight but it had a different choice of mains. The menu sounded quite interesting as I have never seen a veal burger before, let alone on an airline. I wasn’t totally convinced by the concept so I decided to go with the pasta as it also sounded good. 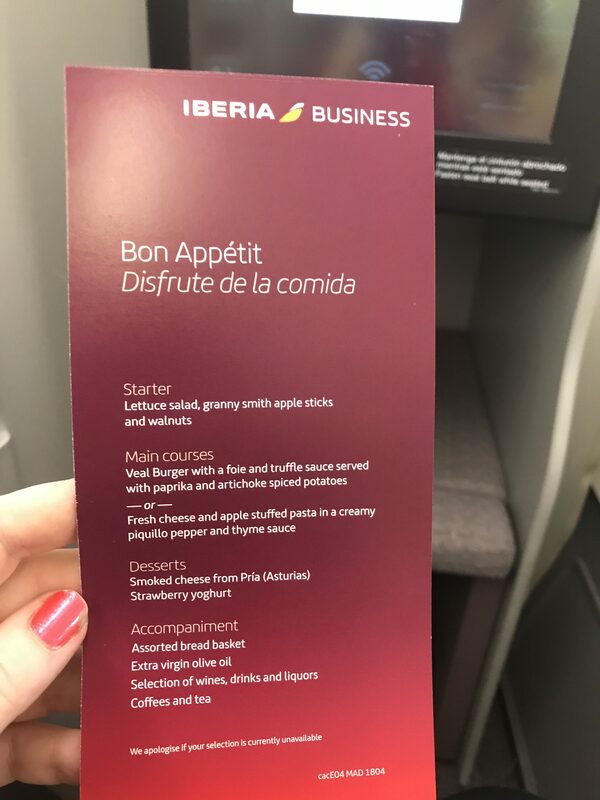 The service was pretty quick and efficient and I found the crew very pleasant despite the reputation that Iberia crew have for being a bit off-hand. 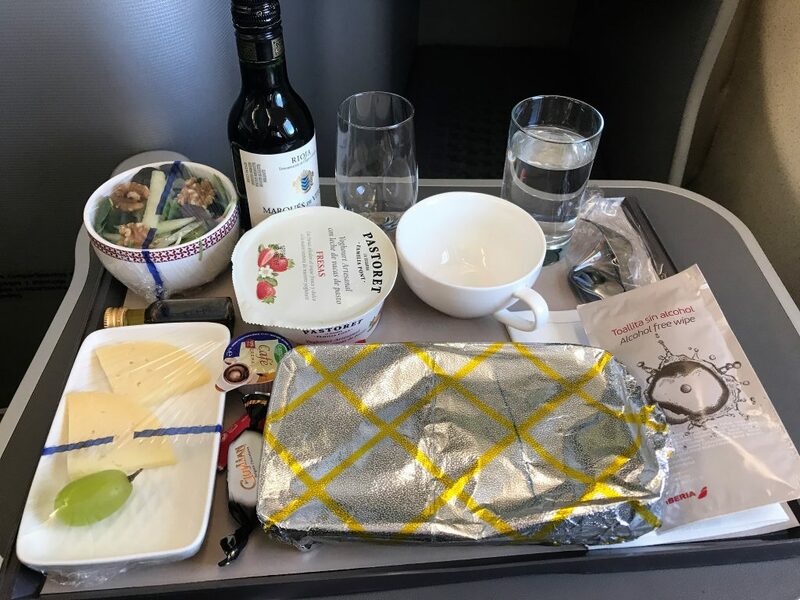 My main criticism of Iberia is that the food is not very well presented – with the cling film and foil it looks like an economy meal! 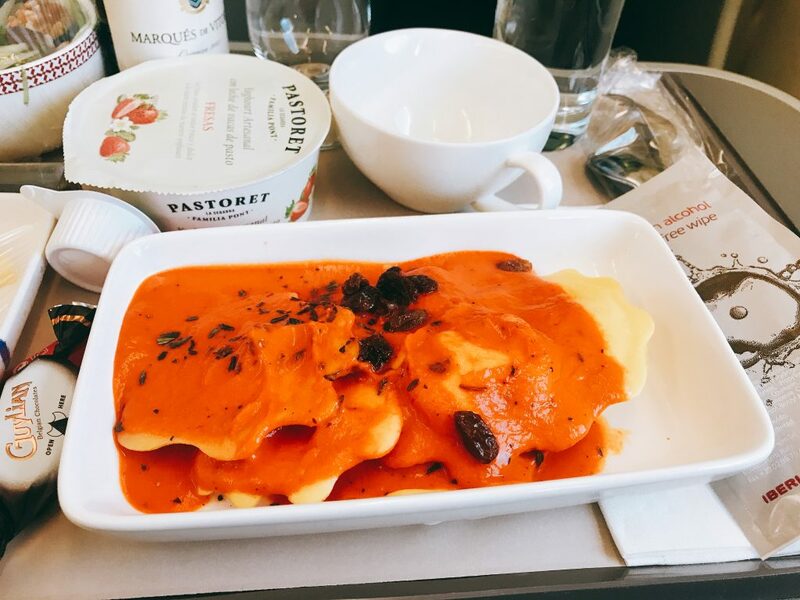 The main course was served at the same time as the tray with starter, dessert and cheese. To drink there was a choice of 2 red or 2 white wines, Cava or the usual spirits and beers. I tried the Rioja wine this time and it was actually not bad for a mini bottle. The starter was a fairly plain salad with walnuts and apple but it tasted fresh and the balsamic dressing made it more interesting. The main course was actually very tasty with the peppers giving it a piquancy which was very enjoyable. Dessert was very dull being a yoghurt but at least it was good quality. 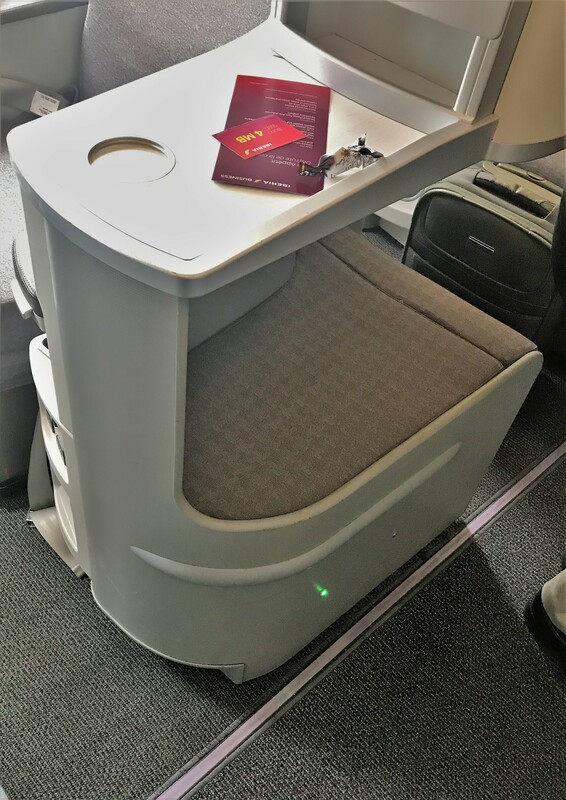 Another feature I liked of the seat (which as the same as the A350) was the large steady table. You could push it out of the way with the tray still on it if you needed to get up before the meal was cleared away. There was Wi-Fi on board the A340 and I thought that it was a nice touch that you got a small amount free but it only lasted a few minutes. The speed was fairly average but useable for email and social media. The TV screen was a decent size although a little smaller than the A350 and the definition was OK too. There was only a limited selection of films and TV being a short haul flight. The screen was controlled with a colour screen touch remote which worked OK. There was an international socket and USB port available for charging devices as well. 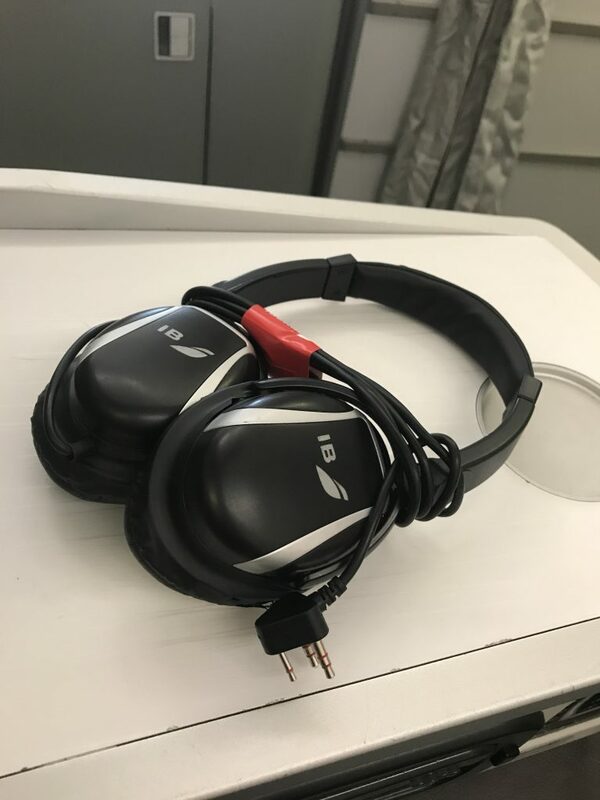 Noise cancelling headphones were handed out but I find these very poor quality on Iberia. On both my recent flights they were crackly to the point of being unusable. fortunately I always have my own Bose QC35 ones. 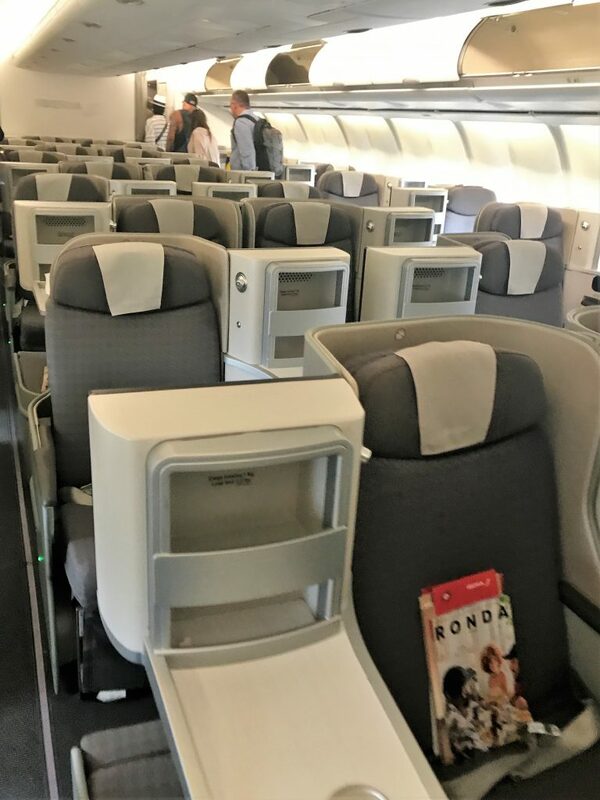 I had heard very mixed reviews about Iberia long-haul seats and service so I was keen to try them on a short haul service before I do a couple of long-haul trips with them in the coming months. Although the food didn’t look the best, the main course was tasty and decent quality. The crew were fine and I liked the seats for comfort and privacy. 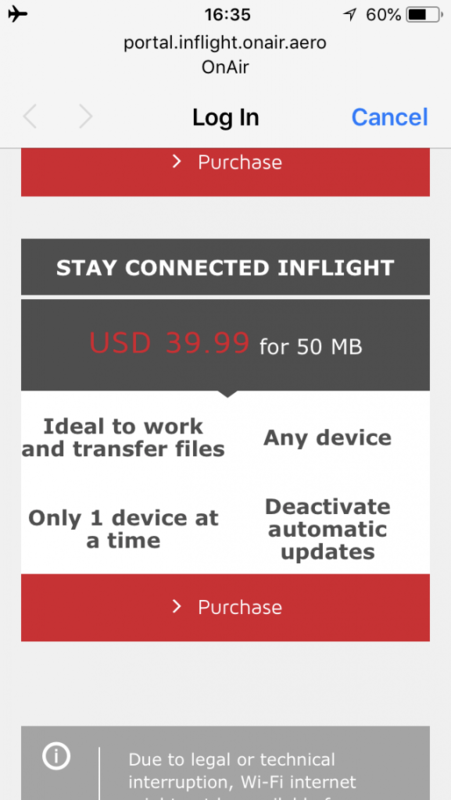 Having Wi-Fi was useful on board and I certainly would consider Iberia for future long-haul flights. 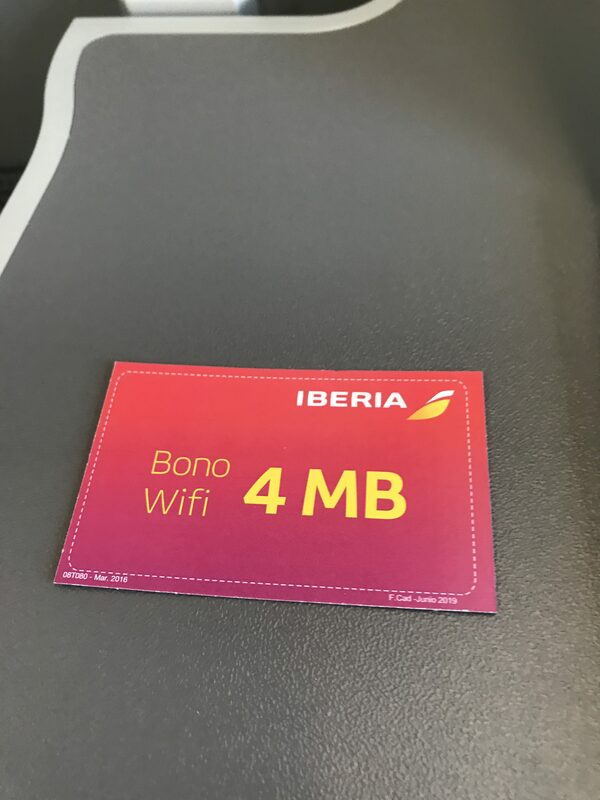 It is worth bearing in mind that Iberia can be much better value for redemptions with lower taxes and Avios required. For example, New York is only about £160 and 68,000 Avios off-peak in business class. You can read more about redeeming with Iberia here. 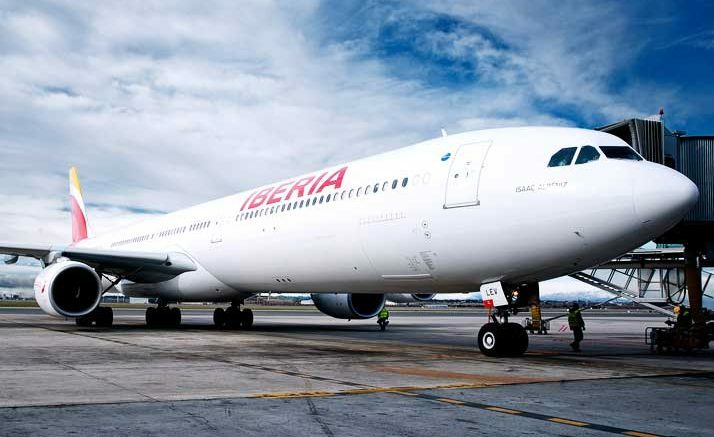 7 Comments on "Iberia A340 business class review"
Expect better finger nails picture Michele. I will book a manicure before the next photo. Trust you to notice! 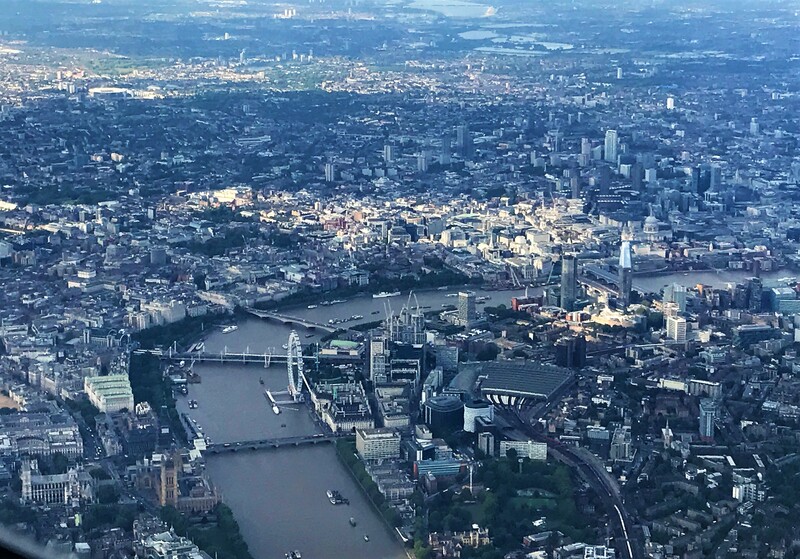 We did a LHR-MAD trip on the IB340 both ways and it was a bit of a shambles. 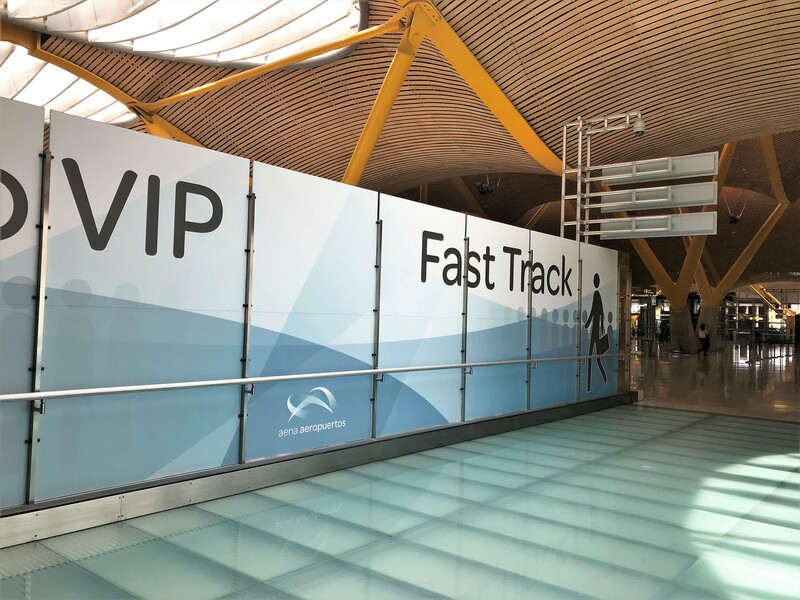 It was booked through BA, with BA Flt Nos but we could only select seats outbound on the BA app – inbound had to be done via Iberia although once chosen we were unable to change them, even going in to MMB through Finnair proved fruitless. 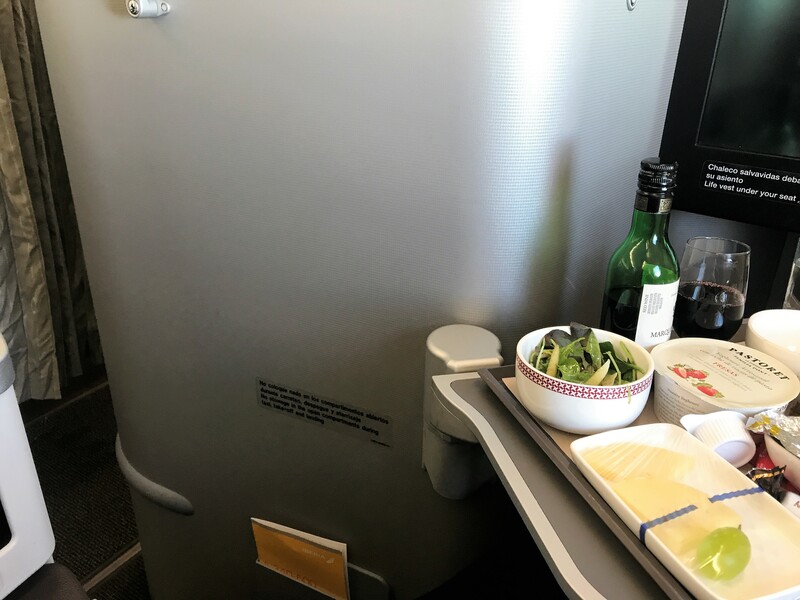 The seats were fine but the onboard service was like something out of the Keystone Cops – they kept banging the food trolley on the (same) seat base and drinks and bottles went flying each time. The food service was different in each aisle – we were in a middle pair so had different menu choices and presentations – apparently one side was sourced from Spain and one side from UK!? Hi Geoff. Sounds like you were unlucky with the onboard service. I am guessing something went wrong with the onboard catering as that would not be normal. 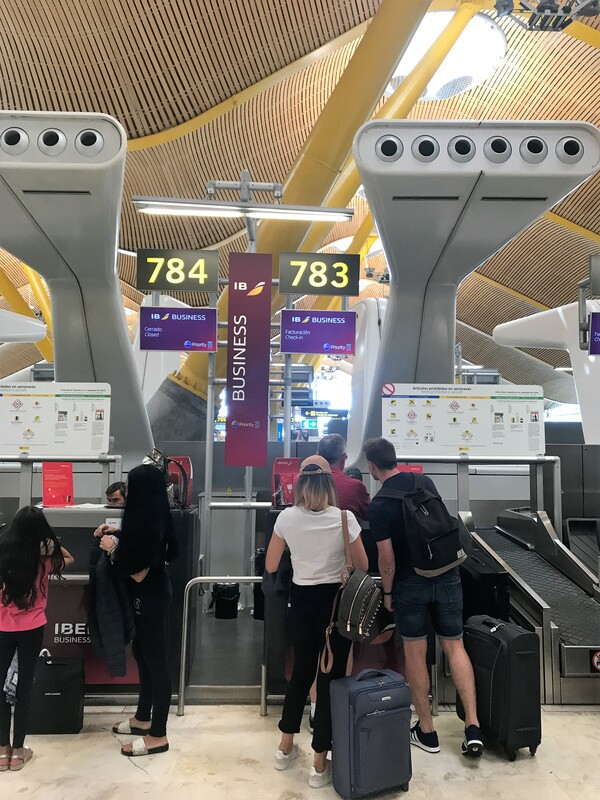 I have found issues with booking IB flights on BA and vice versa, they seem to have some technical difficulties and it lost my seats altogether on the previous flight to Madrid! Which seat would you recommend for solo night flight MIA-MAD? I have 2A atm. 2A is a good seat although I would personally go for 4a to be a bit further from the galley. However in 2A there is more chance of getting your first choice of meal so swings and roundabouts. Though unlikely they would run out of something by row 4.